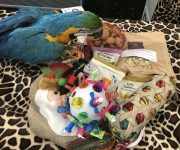 Blue and gold macaw, Charlie, is getting stuck into new toys and treats following a festive donation from her adopter. 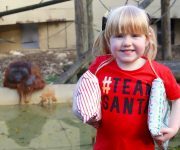 Christine Clive, a long-term supporter of the 27-year-old Discovery Centre parrot sent in a stocking full of nutty treats plus the monetary gift which DZG Presenter Heather John spent on a number of goodies from … Continue reading Charlie’s treats! 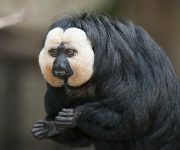 DZG’s saki monkeys weren’t left puzzled by their latest challenge by keepers. 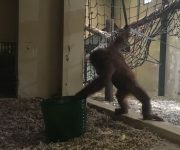 Following a generous donation of an acrylic foraging toy from our Amazon Wishlist, primate keepers have put it to the test in the Small Primate House with great success. Keeper Sian-Leigh Simner, said: “I filled it with peanuts and hung it in the saki … Continue reading No puzzling our sakis! DZG’s chimpanzees enjoyed an enrichment party in celebration of Malaika’s 29th birthday! 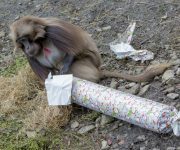 Keepers decorated their outdoor paddock with blankets, sheets and pillow cases and left a variety of treats and items for them to play with – and birthday girl, Malaika, loved every second! 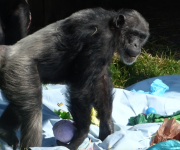 Senior Keeper, Stacey Ball, said: “The girls had plastic ball pit … Continue reading Malaika’s enrichment extravaganza! 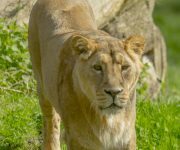 It’s Kyra’s birthday and our beautiful Asiatic lioness is 11 today! If you’re visiting the zoo, make sure you stop by Lion Ridge and wish her many happy returns! And why not treat the birthday girl to some goodies from our Amazon Wishlist? The list, which can be FOUND HERE, is full of useful items … Continue reading Happy birthday, Kyra! 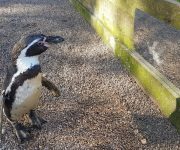 It’s almost New Year and the bubbles are already freely flowing at DZG as we look forward to celebrating our 80th anniversary. 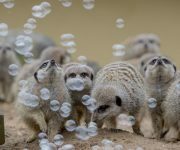 Our meerkat mob had great fun with some bubble enrichment following a delivery from our Amazon Wishlist from generous supporters Julie and Roy Holden, who sent us two large plastic trugs, a bubble … Continue reading New Year bubbles!